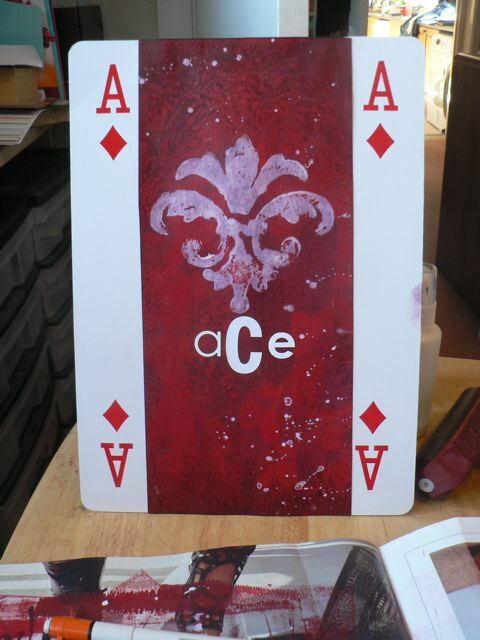 BIG CARDS – Ace of Diamonds! Yay! I have completed a suit. The final Diamond is DONE. As I implied last week I did use the wax paper resist OVER paint and I love how it turned out. 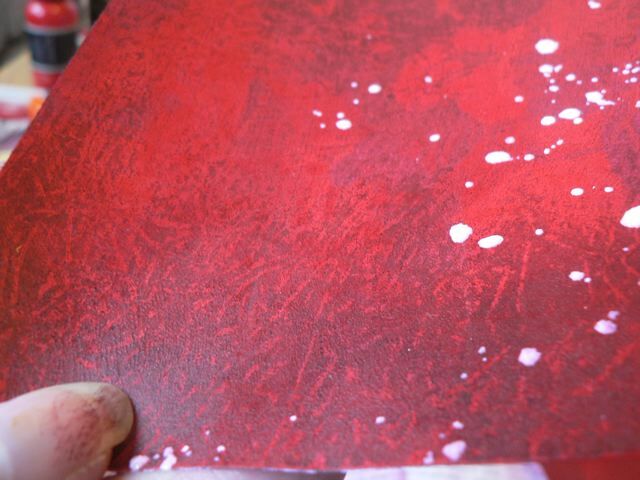 I started by blobbing some different shades of red paint on paper. 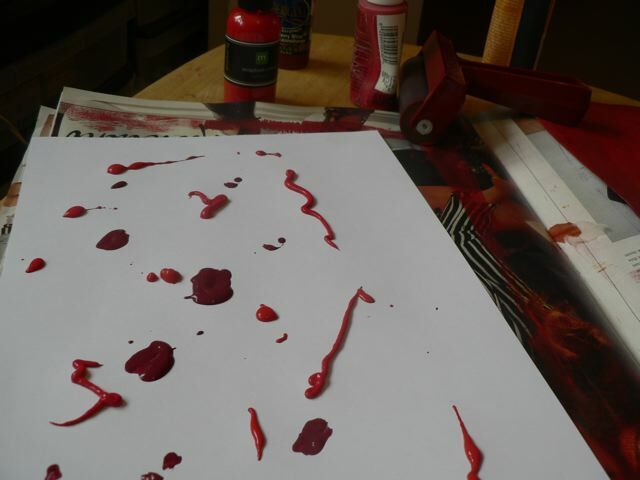 There is a very cherry red, a slightly orange-y red and a darker almost maroon colour. 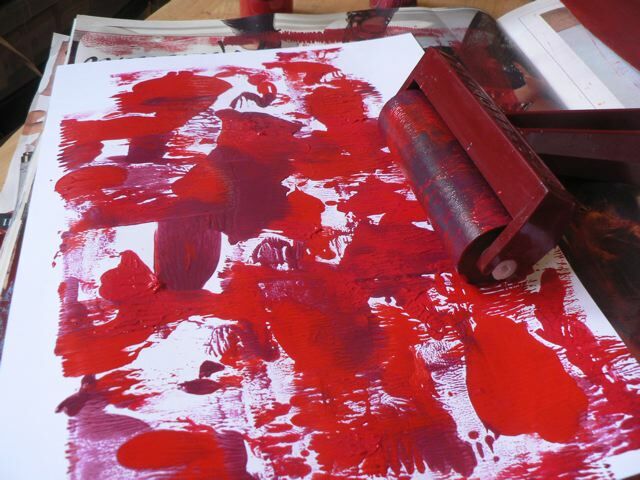 With my brayer I skipped over the surface to distribute the paint a bit…. Before brayering in earnest! Once that had dried, I took my crumpled sheet of waxed paper and the piece to the iron. What I found was that if the iron was too hot, or if the waxed paper was placed OVER the paper, with the protective sheet (and for me that was a Teflon cooking sheet, £1 from the £ Store) the wax migrates towards the heat source, as you would expect, and doesn’t adhere as well as it does if you do it wax paper on the Teflon sheet (or craft mat, or scrap paper) paper, painted side DOWN on the waxed surface, then iron applied to the back of the paper. I think it gives it an almost leather-like look, especially with the Raisin colourwash over it. It’s very hard to capture the detail in a photo but this shows it OK. I am not loading these cards with technique, mostly focusing on one or two per card, so IRL I would most probably combine this with an already painted surface, but one that had a lot more going on than just a coat of paint, to add texture and depth. And I might do more OVER it as well, although I do like the finish as is. Last additions were the white paint spatters and a stamped flourish to complete my card! I am annoyed that the card soaked up a bit of something over there on the right, but can’t moan too much as it was most probably my own fault for being careless and working amidst chaos. So next I get to move on and really explore B&W. But I’m still dithering – spades or clubs, clubs or spades…..?? Categories: art, BIG CARDS | Tags: cards, stamps | Permalink.